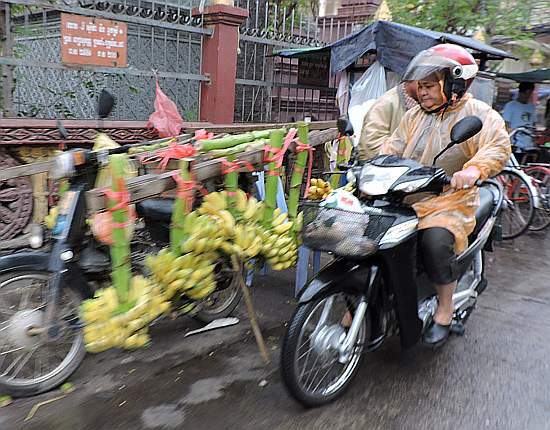 Mission Journal – Page 2 – Welcome to Cambodia, and….. Girl, 12, held in LA school shooting. There are about 125 killing fields in Cambodia, actual fields where the Khmer Rouge took people to execute and bury them in mass graves. There is a large killing field near Phnom Penh and it is a place that the tour groups all go–and they should. Many skulls of the victims are stacked in a large memorial stupa on the grounds of the killing fields. Around the stupa are large, weathered pits were the bones were dug up. 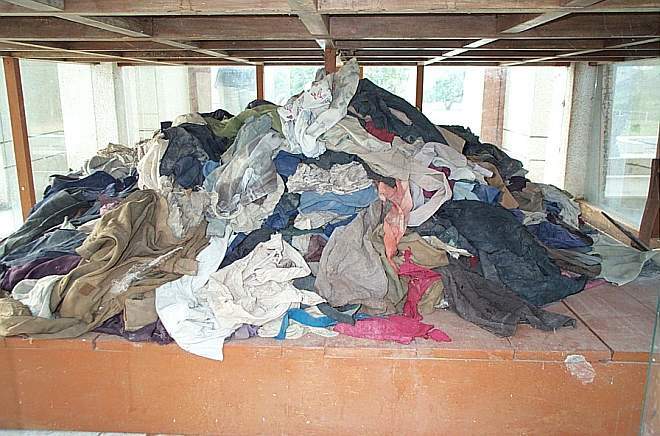 Some of the clothing of the victims has also been collected and is displayed on a wooden platform on one level of the stupa. It looks like it was probably washed but is otherwise just in a pile as part of the permanent display. And along the paths among the burial pits, more bones and articles of clothing keep working their way up to the surface. Only a small portion of the clothing from those executed is on display. Much more is kept in a warehouse and up to now has just remained there untended. Now, though, through a program funded by the US Ambassador, Julia Brennan (R) from Textile Conservation Services, assisted by Jackie, a graduate student from the University of Delaware, will sort, analyze, and preserve the stored clothing for posterity as another reminder of the Khmer Rouge era. 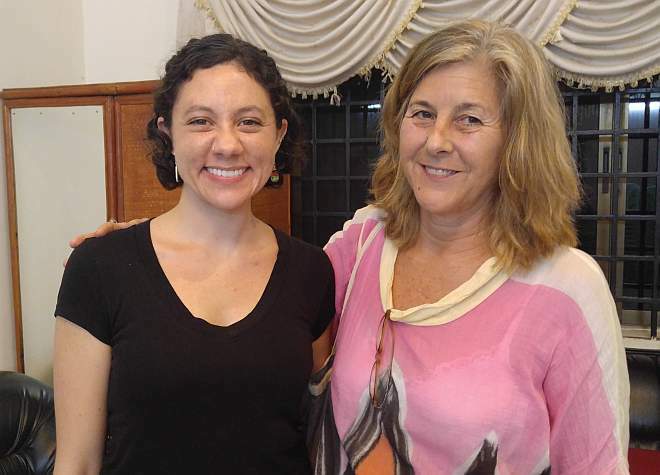 Today Julia and Jackie were part of the weekly Maryknoll Cambodia gathering in Phnom Penh. Today was a busy day with Holy Family Sunday masses this morning in two places and then dealing with St. Vincent de Paul Society cases in the afternoon. Then this evening the Maryknoll Cambodia community got together for a new year mass and dinner together. It was a quiet and enjoyable evening and everyone was gone by 7:00 PM. 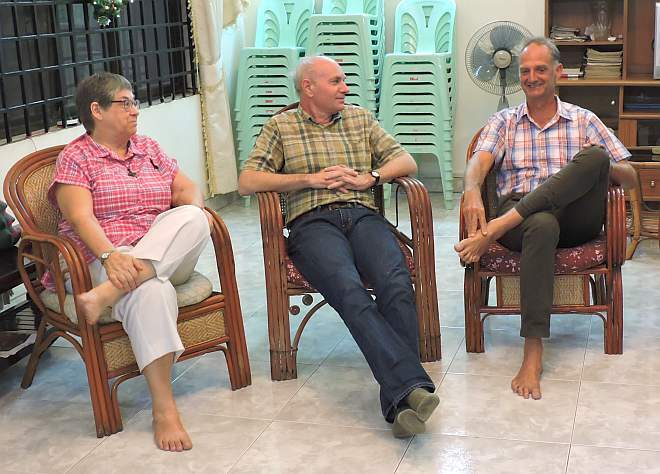 Here Ann Sherman and Russ Brine talk with a visitor, Beau Blank, who works with Maryknoll in Thailand and has spent the last four or five days with us. This evening at the Saturday night mass at World Vision, I met a group of twelve people from Hong Kong who are finishing up a service trip in Cambodia. They have been working in a parish in Kampong Cham Province. 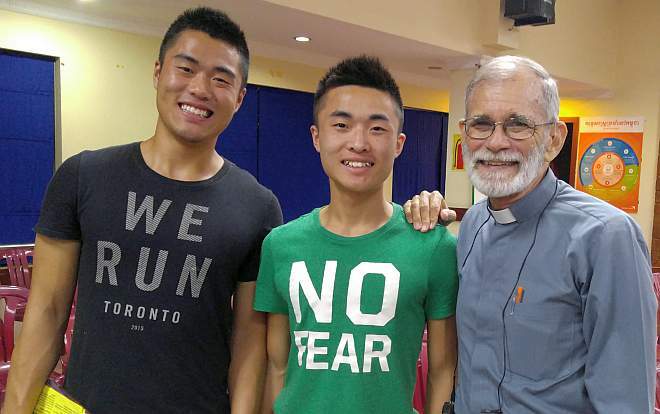 In talking to them I found out that these two young men went to the Bishop Ford Primary School in the Tung Tau Tsuen area in Kowloon. I lived at the Bishop Ford School for twelve years before coming to Cambodia, but I was gone before these two started the first grade there. I wasn’t planning on any more posts about Christmas 2017 but yesterday–Christmas Day–it rained! That is unheard of! When I first came to Cambodia, the common wisdom was that the rainy season ended in October. Through the years it has seemed to rain later and later in the year, and this year it rains on Christmas Day! 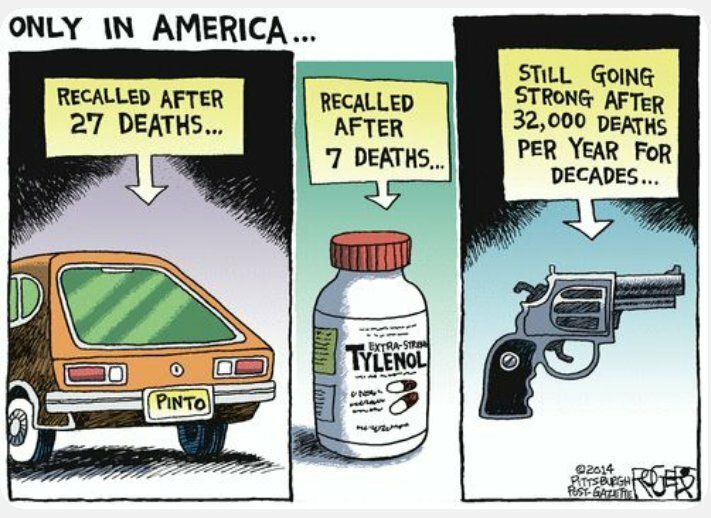 Call it climate change or whatever you want, but CHANGE is happening. 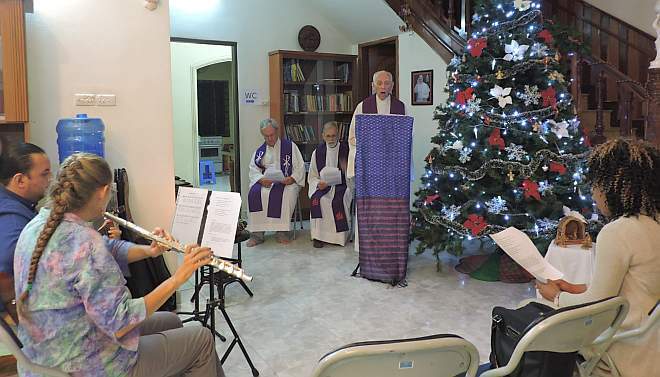 Today was a strange mixture of religious holiday and normal Sunday for the Khmer people; and of the Fourth Sunday of Advent and Christmas Eve for the Catholic Community. Click here to see some of the day’s activities. We don’t celebrate Christmas at the Deaf Development Programme because this Buddhist country makes no connection between Christmas and the birth of Jesus and we don’t want to introduce the commercialization of Christmas and Santa Claus into the culture. But today we had an unplanned Christmas party thanks to the generosity of the landlady of our DDP office building. Click here to see what happened. Every year in Advent and Lent we have a communal reconciliation service, offering the sacrament of reconciliation. 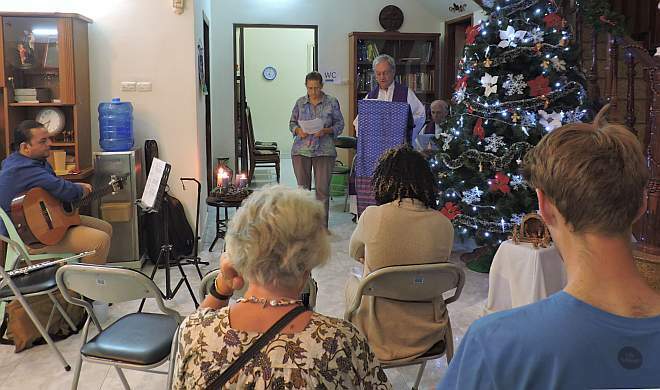 This Advent, for the first time we decided to have the service at the Maryknoll office. Fr. Bob (at the lectern) planned this evening’s service. These services are generally not well attended but this year we had a few more people than we did in Lent. 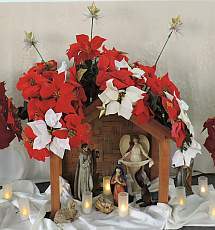 Using the office instead of St. Joseph Church was an attempt to make it easier for people to participate.